Our Universal T-track features a unique "stacked" T-slot that accepts both 5/16" T-bolts and 1/4" T-bolts, as well as 1/4" Hex-bolts. This means you can use all the hardware and T-track accessories from your old jigs in addition to the newer style hardware. 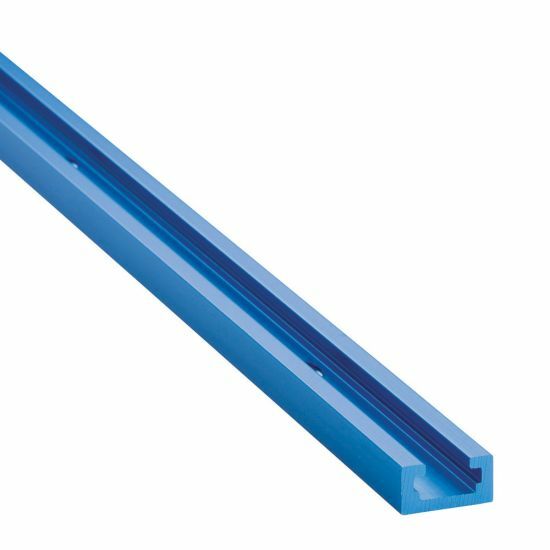 The T-tracks are available in 2 ft, 3 ft, or 4 ft lengths. T-Track Mounting screws not included. We recommend a #6 Flat Head Screw. For added versatility and functionality, combine T-Tracks with 5-1/2"L x 1-1/8"W Hold Down Clamps and 3-1/2"L x 3/4"W Hold Down Clamps. It was just what I was looking for. Worked perfectly. This is the easiest way to hold any work you can come up with. It takes a little time to get it set up but it is worth it in the long run ! As a machinist, all of my machines come from the manufacture with “ t slots “ cut in the work table . So why wouldn’t you want to use this idea in woodworking? I recommend this to everyone who does woodwork! This product was easy to install and provides and enormous capabilities to my radial arm saw in/out-feed tables (movable fences, clamping capabilities, etc.). The universal t-track is a great product the performs exactly as advertised. 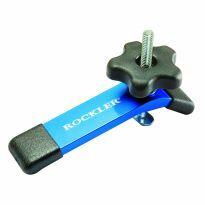 However, I am mystified why Rockler does not include or sell the mounting screws. Got the 36" versions on sale for half off. I would not pay full pricce for them. I used two to set up a wooden table on my Nova drill press and they are true and a perfect 3/4" wide for a routed slot. I used another two to give my cuttoff sled extra long runners that slide smoothly and fit tight to the table saw mitre slots. I have two left for future jigs. Very nice and easy to install on top of a fence. Just as good on a cross cut sled once the dado has been routed. Very good I use it on my table saw sled with T-slot clamps to hold material inplace while cutting. 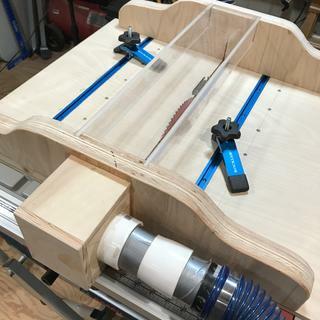 Table Saw sled with T-tracks and clamps. The T track puts the finishing touch on my homemade router table made out of "throwaway" wood. Adds a nice look to any fence/sled! Needed this to finish my router table project. 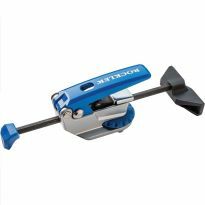 I've used Rockler T-Track for several projects now (jigs & tool/work table tops) and compared to the other tracks I have used it is excellent. Dependable quality at a reasonable price - can't beat that! I particularly like their "kit" deals that include knobs & bolts along with the track because of the lower overall price for the whole project when I need true track bolts. I also really like the appearance of the finished projects featuring the royal blue track. I needed 10 inchs of t-track to complete a jig I was making so the 36 inch track will be use for another project. I like that two types of bolts may be used with this track. I have hold down clamps that use both types . I am in the process of completing my router table...work bench. The T-track is a quality product and a reasonable value at the sale price. I can't make this, so it is a great value! It does what I wanted it for. The T Track allows me to clamp material to my work bench . great product ! very versatile proiduct. it is simple and can be applied for meany diffirent projects. it works great on my workbench and routr table! I'm just getting started wood working and my bench is coming along slowly. But these tracks are just the thing I needed. Got the cookies and clamps and I've used them both on day one. I would suggest this setup to anyone. The only problem is I need more attachments and I can't buy them all at once. Hopefully rockler and I are on this adventure together. These T-Tracks are the best. Accepts multiple styles of hardware and make the workbench much more useful. Only wish I had invented it. Will work perfectly with my project. I am designing a building my dream assembly/work table and bought this to see if it will work in my design. It will and the fit and finish are perfect so I will be buying additional lengths to complete the project. My table is based on a design from Wood Magazine using Unistrut for some of the parts and 2 x 4's, but I have added a Lazy Susan for an indexing center turntable. The T-track for all of my clamps. Along with the hardware,I can now create my own jigs on demand. Love these T and miter tracks from Rockler! Smooth action and finish. Very durable. And very reasonable price compared to other similar products. This is a good quality product. I use a lot of it so, I kep on buying it. These are Great ! No more Screwing into the spoilboard to hold the material and they truly hold the material in place ! Very well made and versatile. Easy to cut to length needed. Only thing I thought was odd was that screws necessary to attach to wood were not included. I can't recall the last time a piece of hardware that needed screws didn't come with them. I use this track for most of my jigs and at my miter station. They have always worked flawlessly and install is very easy as well. I will be getting more as needed!!! 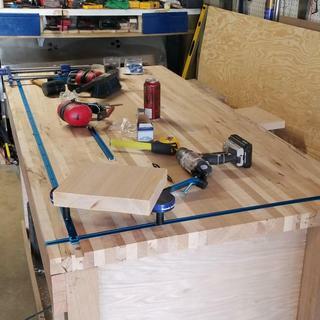 You can find a lot of uses for this, workbench top, jigs, etc. Very easy to install - just rout a 3/4" wide by 3/8" deep slot, anchor with screws and you're ready to go. These T-Tracks work great ! I installed them on my router table. holes to install two more screws to hold them down. They cut easily with a hack saw. This makes it so much easier ! Love these things. I’m not a wood working guru by any means and i don’t really even use these tracks for it. Instead i use them for my reloading bench. I can lock down different presses or a vise or anything really. They make for a super clean work bench. better than a extra hand with all the accessories. Strong and perfectly sized, pre-drilled track. I was extremely happy with this product, as always everything I have purchased from Rockler has met my expectations and performed very well. They are a great company to deal with and they have quality products. 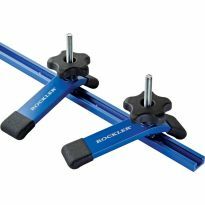 I bought a couple of T-track sections during a recent Rockler sale, but at the time did not have any particular purpose for the purchase. 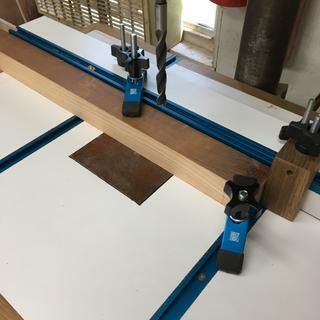 But once I decided to create a wood cover for my table saw (to convert it to another shop work surface when the saw is not in use), I decided to install T-track so that I could use hold-down clamps. Then when I was fabricating a medium size saw sled, I incorporated more T-track into it to allow for a stop system I created. T-track gives all sorts of opportunities to be creative in shop fixturing. I'm thinking it will also help me be creative in some other projects as well! 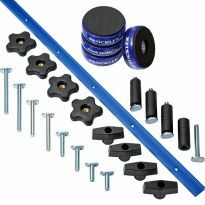 I highly recommend these quality T-tracks from Rockler! I need it to add another feather board to my table saw. This track will fit the slot in the table saw. I need all of the items to go along with your T-Track system which I will set up on the side table I am building for my radial arm saw. This table will serve as a multi-purpose table. T-track for the top of the crosscut sled. Allows adjustment of the flip stop or a hold down clamp. For my table saw table. 10" Craftsmen inserted in wood cabinet. I bought it to make future jigs and fixtures in my shop. I am renewing my router table and need these to complete the job. This price was right! It's very useful in building variety of jig. Rockler's works best for me. 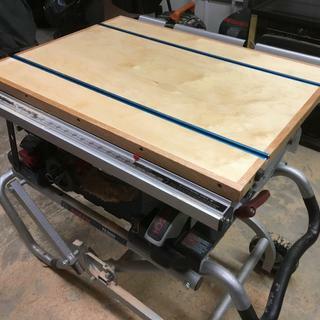 Making a router table. 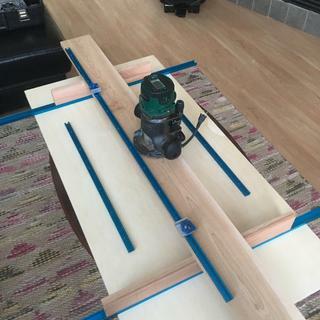 Product is good, Sturdy and it will make a great addition to my router table. These t tracks are great to use in workbenches and jigs and fixtures. Their use is limited only by your imagination. There are numerous clamps, hold-downs and devices that will fit in them and that makes them multifunctional. No woodworker should be without them. This will ride in the tracks of the T-track table top mentioned above. For my X-carve Cnc router. T-Tracks are so useful in custom benches! I will be building my assembly table and these were a great buy. Been wanting these to make router table and the price was right. This T-track is good quality. It will be used in a drill press table. The price is excellent! We've used this track on past projects and find it works well to hold materials in place. Price and need. Setting up new shop. great sale price for something I've been wanting to buy and use. What size screws are recommended for mounting T-tracks? 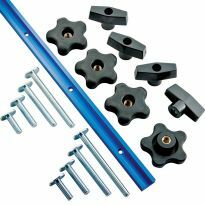 Rockler recommends a number 6 flat head screw for regular t track, a number 8 for some of the multi tracks. I am building a shop table that will measure 48" x 52". What T-Track pattern and spacing would you recommend? BEST ANSWER: Come in 3" on ur two long sides & go to 3" on ends & do the same. If money is available go to the center having a T with short pieces going in all four directions till u meet the previous tracks. I'm considering using this to attach presses and tools to a reloading bench with a 1 1/2" butcher block top. How strong is the t-track? Do I need to worry about it pulling out of bench? BEST ANSWER: Just looking into this product in preparation for my reloading bench. My concern is with the progressive press for sure. If the table has the depth available ( I'll have almost 3" of fir ), I'll pilot a few more fastener holes in the location where the press will do the majority of its work. Really hoping the depth and gauge of the T-racks are sufficient. I have an RCBS Rock chucked and broke a quarter inch he head bolt I had holding it down. These tracks aren't heavy enough to hold that kind of torque. I reload for a .338 Lapua Mag and a Barrett .50 cal. Lots of pressure required to full length resize those cases. Smaller calibers might hold up. 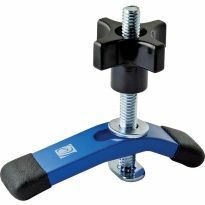 will my rockler auto lock clamps fit into this track? 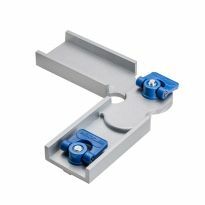 Is the track compatible with standard bolts and Kreg clamps? BEST ANSWER: They will NOT work with Kreg clamps. 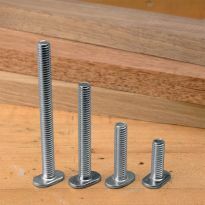 I have the Kreg Klamp table and the clamps on those use a larger sized rounded bolt/screw. I've tried to put them into the the t-track & they don't fit. 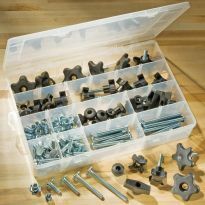 Can you change out the Kreg hardware with the Rockler? i.e. are the threads the same. Not sure I understand your question about "threads". Two other folks answered the original question and they are correct. 1/4 - 20 bolts with a hex head fit fine as do most "toilet flange bolts". They will accept 5/16" T bolts or 1/4" Hex head bolts. Don't know about the Kreg clamps. they also work well with toilet flange bolts. The 1/4" 20 thread is very universal. Can the t-track be cut down to smaller sizes? BEST ANSWER: Yes, the T-Track can be cut to custom fit your application. It is soft aluminum so a hack saw is the recommended tool to cut it. Yes you can but it may also be necessary to drill a new mounting hole with countersink for screw head. I have cut several. Make sure you get a clean cut. how do i sink this into my workbench? BEST ANSWER: It is 3/4" wide and 3/8" deep, so I used a 3/4" router bit and routed it 3/8" deep. To make sure it was straight, I used a router guide. I used a router with a 3/4 bit, but the fit was a little tight. Instead of making another pass to widen it, it was easy enough to gently tap in making a nice snug fit. If you want it to drop in, you'd probably need another pass to take another 1/16 of an inch or so off. I used a handheld router. Worked great. What kind ,size of mounting screw should I use to mount this and what kind of router bits to be use to mount this in a router table? will this track work with a miter slide? BEST ANSWER: If you wish to use a "standard" 3/4-inch miter gauge, then you want miter track, not T-track. 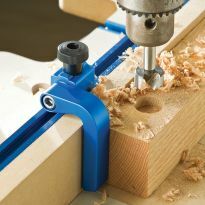 Rockler also sells miter track, such as this: http://www.rockler.com/rockler-36-miter-track and others. T-track is also 3/4" wide, but that's the outside dimension, not the inside width. So, you could you T-track as the miter bar, but not the slot. In fact, I've used spare pieces of T-track as miter bars on my own jigs and fixtures. I hope I haven't confused you. I would have to say that it depends on how you are planning on using the miter slide, and your definition of a miter slide. I have one mounted on the top of the wooden extensions I put into the miter gauge I use on my table saw. This is really helpful for cutting multiple pieces with exactly the same size. I put a stop block into the t-track and I'm off and running. I also have one setup on the fence I built for my miter saw. Again, repeated cuts to the same size are a snap using this with a stop block locked into the t-track. I like the versatility of the t-track and all the gadgets that you can use with it. Miter slide and T-track are two different things. It fits in the miter tracks for my table saw. Clamping it into place would be the issue. It f its snug so horizontal pressure is ok. Vertical pressure would pull it out. Depending on the size of cut you are making, it could be clamped down to the saw deck. 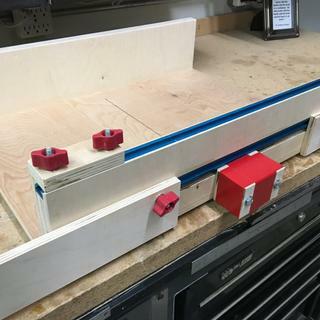 With my table saw sled, I use it with hold down clamps. I cut a slot in the router table I built and mounted it in there. This will not work with a miter slide. When I say miter slide, I am assuming a miter bar for a 3/8x3/4 miter slot. If you want a miter slot and t track, I have used the dual track, which is one piece with both a miter slot and t track. What are the out side dimentions (W-H) of the Universal T track? BEST ANSWER: These are 3/4" Wide X 3/8" High. As the description for the item says, it's 3/4" wide by 3/8" deep. If I want to make a table saw fence using these t-tracks as the slide, I was wondering how much play there was in the track with the bolts in place. Would that work? BEST ANSWER: I assume you're fabricating a top for your table saw and want to use the tracks to be able to move your fence. I did a similar thing for my drill press and the bolts hold tightly in place in the tracks. However, I don't put any lateral pressure on the fence in that application, but I think they should be fine. 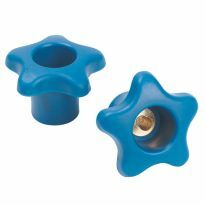 I use knobs on my bolts to tighten them in place, like the attached. Yes, I have an older Craftsman table saw and the Rockler T-Track fits perfectly in the standard table saw miter fence slot (3/4 in. width x 3/8 in. deep). There is virtually no side to side play and the track sits even with the surface of the table saw. Hope that answers your question. There is enough play that you would need to have some other means of ensuring that the fence is parallel to the blade. In other words, the T-track alone will not ensure that the fence is parallel to the blade. With the bolts in place, there is literally no play whatsoever. It should work just fine and make a very nice table saw fence. I can not visualize what you are trying to accomplish. Try rewording and/or attach a sketch?? BEST ANSWER: I would not consider mounting it on top of plywood. It would be in the way of anything and everything I can imagine when building a jig. It would also be weaker in that lateral pressure would no longer be supported by the wood. My thought is to not take such a shortcut. Thank you! I don't have a router or table saw to make dado. It was just going to be used to make the fence moveable on a log sled for my bandsaw. Does that make a difference? If you ever watch Paul Sellers, he has some free classes that will teach you how. (Not allowed to send links as a reply, so Google it. )You would only need chisels and a hand saw. If you don’t have even these tools, go ahead and try it your way, but be prepared to damage and discard the tracks. Perhaps if you are careful they will survive. Yes, it could be mounted on top of plywood. However, for most uses it is better to have the top of the "T" track flush with the work surface. You also gain additional strength by insetting into a groove. Probably depends on what your doing with it. If you will be putting a lot of pressure on it probably not (ie. clamping down wood) I don’t think it will be stable enough. I was going to use it to make a sled for sawing logs on my bandsaw. It would just be so the fence could be moveable. Thank you! There are countersunk screw holes pre-drilled in the channel, so it can be surface-mounted or installed in a groove. Would like blue screws to mount t tracks. Where do I get them? BEST ANSWER: I guess that the answer hinges on form versus function. As long as the tool functions properly, the blue screws are irrelevant. I don't know. I would spray print them blue. I would spray paint some to match. Can this T Track can hold a reloading press? BEST ANSWER: There can be a lot of pressure exerted in the reloading process. It depends on which part of the reloading process you are doing of course. I'd be cautious. I do some reloading and I have purchased the T track. I would think that there wouldn't be a problem using it to mount a reloader. No, the tiny screws that anchor the track to the wood will not hold that much force. Even if they did, the track would spread. What size are the mounting scews? BEST ANSWER: Thank you! I am pretty new at this and trying to get it all together. Can it be mounted on a vertical surface and will the accessories work in a vertical orientation? BEST ANSWER: Yes, the T-Track can be use in any position so long as the insert slides unobstructed. There are mounting holes in the base of the track that can be used to position the T-Track. I know you can just slip the head of a 1/4-20 hex head bolt into the slot, but should you use a washer with it to get more grip on the track? I've tried the hex bolt but I'm afraid I'll damage the track if I don't use a washer to span the track... ie; a washer might give the bolt extra surface to contact the track.?? You don't need it, but use it if you want. Be careful not to over tighten. It holds firm without a lot of pressure. Being an aluminum track you shouldn't over tighten your fastener. I'm concerned about this as well. Is this T-Track Blue on the surface or Blue clear through? BEST ANSWER: Blue coated aluminum. The blue is only a surface coating; I believe it is an anodized coating. Cut the T-track and you will see the native aluminum underneath. What are the dimensions of the track ,how wide do I need to make the slot in my table for a snug fit? What size bit do I need for this ? I'm about to build the bench of my dreams, and trying to consider all options or needs before constructing it. 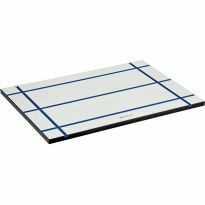 Has anyone ever mounted T-track in their workbench surface, to use instead of drilling bench dog holes? I can't help thinking the T-track would end up being more versatile a surface feature than ordinary bench dog holes. I imagine it would be easier to install too, by just routing the channel using a bench-long straight edge. Any thoughts and observations? Thanks! Is this the whole kit or just for 1 rail? 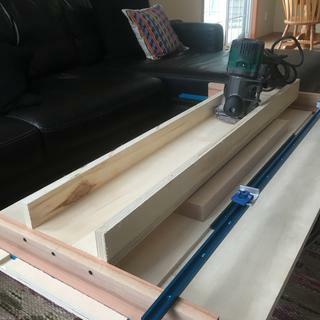 Also, I am building a 32L x 24W CNC machine (that's the usable surface area of the table) what would you recommend as far as how many t-track slots I should use and any other parts. BEST ANSWER: It should tell you when ordering. I have done it both ways, but the last few times I’ve gotten just the rail. I don’t have a CNC machine so I can’t say. I would think maybe 2 should be enough. 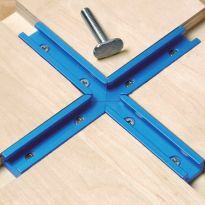 does this track work with the Kreg auto max clamps that slide into their folding project table? BEST ANSWER: The Kreg channel opening is slightly smaller than the T-Track opening. The bolts for the T=Track will not fit the Kreg channels. BEST ANSWER: I've only heard of dadoing the top edges to clear the tabs or grinding off the tabs. If you search "Sears table saw miter slot" you can find videos on how to modify a runner. my miter on my table saw is 3\4 wide will it fit in the t track? 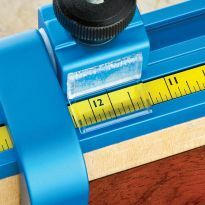 BEST ANSWER: The miter gauge on your table saw will not fit inside the T-Track. The bar is too big. If you are asking if you can insert the T-Track into the table saw slot? Probably, The T-Track is outside dimensions are 3/4" wide and 3/8" deep. Is there an aluminum bar that will fit in the track so that you could have a smooth table surface if you want? I am looking for the measurement of the inside of the t-track to see if what I have will match up with Rockler t-track. mine is bottom of t 7/16 and top opening is 3/8 wide and its the same size wide 3/4 and same dept. 3/8 . also need more bolts to fit my track to ,if the same that will be easy . the upper measurements are the inside of my track thanks . thank you for your answer, can you put them numbers into the form I have , not sure what your numbers are compared to my numbers in my ? Your 3/8" top opening is .375" that's larger than the .350" Rockler opening. Your 7/16" t-track is .4375". This is smaller than the Rocker T of .55". Both tracks would accept a 1/4 bolt head. any longer length offered? like 8'? BEST ANSWER: The ones I bought from Rockler I think the biggest was 48". I saw some from Orange Alum. I think the name was longer.